Allied Irish Banks (AIB.IR) was nationalized in 2011 by the Irish government and it now owns 99.8% of the outstanding shares while the remaining 0.2% remains in public hands. At the time of the nationalization 25% of these shares were traded in New York as ADRs (AIBYY), and because of this development the depository decided that it would cancel the ADRs. As a result they have started to sell the shares underlying the ADRs on the Irish stock exchange, and when the selling is done the cash will be returned to ADR holders. Because the depository owned a big part of the outstanding float the sale process is taking some time. They have started selling shares on April 10, 2012 and at the end of 2013 they managed to sell 65% of their shares. Because of this the ADRs now consist mostly of cash instead of Allied Irish Banks equity, but despite this fact they trade as if this is not the case. A Seeking Alpha article alerted me to this opportunity this weekend, and it’s worth a read to get some more background information. Unfortunately the methodology employed by the author to calculate the value of the ADR, and the time remaining before redemption is seriously flawed because he uses a time-weighted average price to estimate the average selling price instead of a more realistic volume-weighted average price. We first need to figure out how much shares have been sold. We know what the number was at the end of 2013, but we don’t know how much has been sold so far this year. I will assume that the depository continues to account for the same percentage of the market in 2014 as it did in the previous years. I think this is a good assumption because in these kind of transactions a broker usually gets an instruction to sell everything as fast as possible, but with a threshold based on the average traded volume to prevent a too big market impact. This means that the depository accounted for 28.88% of daily volume in 2012/2013. With the ADR trading at $1.61 it is significantly overvalued, especially considering the fact that there will be a $0.05 fee when the ADR is cancelled. With less than one share per ADR remaining there is also a clear catalyst for this short. At the elevated trading volume that we have witnessed so far in 2014 selling the remaining 24 million shares should take less than two months. A good thing considering that we do need to pay a 5% borrow fee for the privilege of shorting the stock. Shorting AIBYY seems a relative save way to generate a return that will be uncorrelated with the market in a short period. There is of course uncertainty with regards to the exact value of the assets underlying the ADR and there are also other risks related to shorting such as facing a buy-in notice or just seeing the borrow fee getting increasingly expensive. But at current prices I think you are paid more than plenty to take these risks. 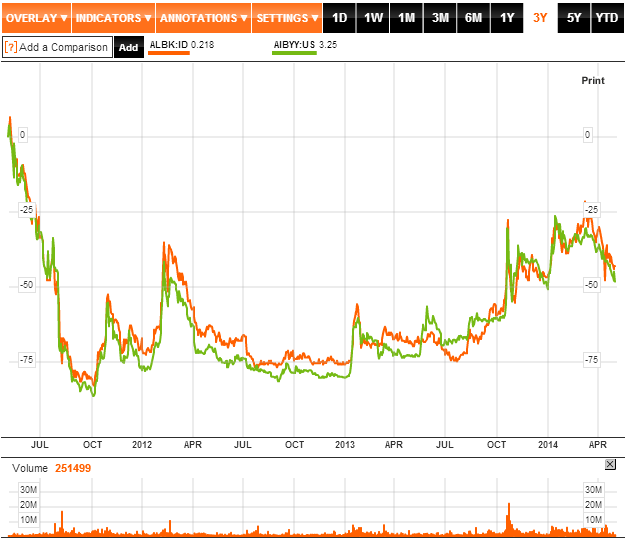 This entry was posted in Portfolio and tagged AIB.IR, AIBYY on May 5, 2014 by Alpha Vulture. I have two minor points and a question. Minor point 1 – I’m very confident that the trustee has been converting the euro proceeds from the stock sale to USD as the liquidation process has taken place. Your calculation assumes that all of the proceeds are converted at current FX rates. Although the current rate (as of 5/28) is 1.34, the average since the liquidation has commenced has been 1.31. This change would significantly reduce the USD value of the sales to-date. Minor point 2 – I think your assumption regarding the pace of liquidation is fair. However, it implies that the liquidation process should be completed sometime in June (based upon the numbers that you provided, YTD just under 60mm shares are traded monthly, at 28.88% of volume, the remaining 24.11 million shares to be liquidated would require less than 1.5 months to complete). However, the trustee has just extended the conversion period to convert the ADR into 10 shares until the end of June. I’m not saying that you are wrong, but it is surprising that this period would be extended if we are that close to the completion of the liquidation. Based upon the above points and the $0.5 fee, I think there is still some decent value in the trade which brings me to my question. Do you know how the actual exchange of ADRs for liquidation proceeds will occur? Will holders simply receive the cash proceeds into their account? Will holders be required to tender their shares (in which case being short the shares could be quite risky)? 1. If you are indeed certain about about the timing of the euro proceeds in dollars you are right that the current value of the cash would be lower. But since I’m not certain I thought that using current exchange rates would be more appropriate. 2. I don’t think you should read too much into that. The fact that the depository allows conversion is IMO very surprising in itself. I’m guessing they will allow this until they have completely exited their position in underlying shares. 3. The $0.05 fee is a reason not to be long the ADR, but not a reason to be short: there is no symmetry like there is with dividends: if you are long you have to pay the fee, but you don’t get the fee if you are short. I also think it’s unlikely that the market prices will adjust to reflect this fee. People are probably only going to notice when it shows up on their brokerage statements after the ADS are cancelled. 4. I’m pretty sure that the cancellation is a mandatory event: longs simply get cash in exchange for their shares. The depository doesn’t want to have some shares that remain outstanding; a very real possibility if you do a voluntary corporate action.